What are the methods to auto eject parts (into a collection area/box/basket) in order for the 3D printer to continue printing? For some reason this feature isn't common (yet?). Is there a hidden reason why? Will using the print head to ram the part off the build plate into a basket nearby cause the print head to misalign (if using belts). I am planning to use a Cartesian XY-Head type (like CoreXY) printer, where the build plate moves along the Z axis and XY axes are on the ceiling of the printer using belts to move the print head. While the "best" method is probably unanswerable since it would be based on very specific requirements and subject to change as soon as a better method were devised, here are some feasible methods to auto-eject 3d printed parts. Some of these are methods that I've considered for my personal use, others have been mentioned by others and added for helpful reference. Some have been done, others have not (I think), but all of them are feasible. In this concept, parts become dislodged from the print surface as it is deformed around a roller in the process of scrolling to the next position. 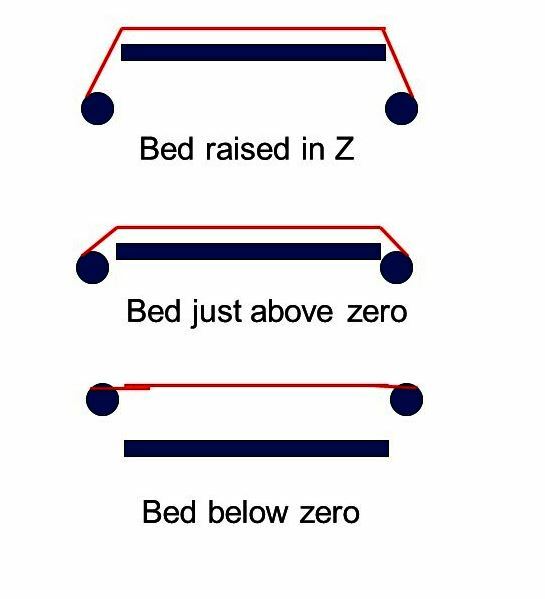 Scrolling bed designs must make allowances to prevent parts from lifting up the bed material which becomes an issue especially with warp-prone materials. Note: This is the basis of the Automated Build Platform (ABP) originally designed (as far as I can tell) by Charles Pax and later covered in several patents by Makerbot Industries. This method mentioned by Fred_dot_u and AllanL uses a specially designed plow arm to sweep parts off the bed between prints. This method has been effectively demonstrated in this video by New Valance Robotics Corporation that was mentioned by AllanL (thanks!). Issues using print head to eject parts: While this method has been tried, and demonstrated (see below), it has some challenges/drawbacks. In addition to skipping steps, mechanical issues such as ratcheting/skipping belts or unwanted frame movement could result from even moderately stuck prints. Examples of pushing or ramming parts off of bed: While using various parts of the printer to push parts off of the bed may not be an ideal solution, it may be an adequate solution for specific circumstances. Here are a few demonstrations of the "ramming" method. Ramming parts off with frame and moving bed like this. Ramming part with robust print head like this. Ramming easy to remove part with print head like this. Interesting question. I hope this helps! From the standpoint of a hobbyist user with a mid-range machine, my answer is based on the model release from the build plate. With a heated clean glass plate, my model will almost always release once the plate has cooled. The "almost" aspect means that if you want to use the print head to push the model clear, you will be confronted with a stuck model occasionally. The amount of force applied by the head may be enough to release a stuck model, but "may be" is not going to be sufficient. Especially with a core-xy system (used by my Emblaser laser engraver), you can either toss a belt or cause a stepper motor skipping. More powerful motors will reduce the skipping possibility, but not the belt jump problem. You could consider to add one additional motor with a sweep arm, geared in such a manner as to provide the necessary torque, along with a force sensor to register a model stuck so badly as to be impossible to dislodge. Your g-code would be written to lower the bed to the appropriate location to allow the sweep arm to operate, while the force sensor would be tied into the pause/stop circuit of your controller. Some controllers already have the ability to manage an additional motor, as some are manufactured to provide for dual extrusion. If such unattended operation is going to be a requirement, you'd also want some form of aborting a failing or failed print. Here's a wild idea. Since you're planning to have a bed which only moves in the Z-axis, build a roller system which feeds a thin, flexible layer of some material (unobtanium, I fear) to cover the build plate. The feed rollers have a weak spring to provide some tension to keep this layer flat but not overly stretched while building the part. When the part is done, lower the bed to zero while allowing the roller to retract excess parts of the sheet (rollers on both sides of the build plate will have to do this). At zero, lock down the rollers and move the bed to some negative Z position, causing the overlay sheet to pop free of the bed and ideally pop the printed parts loose as well. Not the answer you're looking for? Browse other questions tagged printer-building build-plate or ask your own question. How to automate printing of multiple parts continuously? Multiple unattended prints using extruder to sweep build plate? For a larger build volume, what lengths of 2020 aluminium do I need? Lead screw holder - shall I buy metal or just use a printed one?